The Leopard 50 is replacing the popular Leopard 48, but this constitutes an entirely new yacht, not just an upgrade of the older boat. The new 50 is 2ft longer than the 48, and the beam has been widened from 25ft to 26ft 5in. It is also available with a flybridge, and to minimize your suspense, it’s wonderful! Note that Leopard makes a point of calling it a “lounge” rather than a flybridge, and the version with said lounge is therefore called the Leopard 50L. There’s another version sans lounge called the 50P, for performance. Aside from the lounge seating on the hardtop abaft the helm, the only real difference on the L version is that the boom has been raised a bit, so no unwary guest gets whacked. One thing that has always impressed me about Leopards is that they are built tough. The construction is aimed for the bareboat charter market, where 50 skippers a year with varying abilities will inevitably put the boat through the wringer because, well, it isn’t their boat. 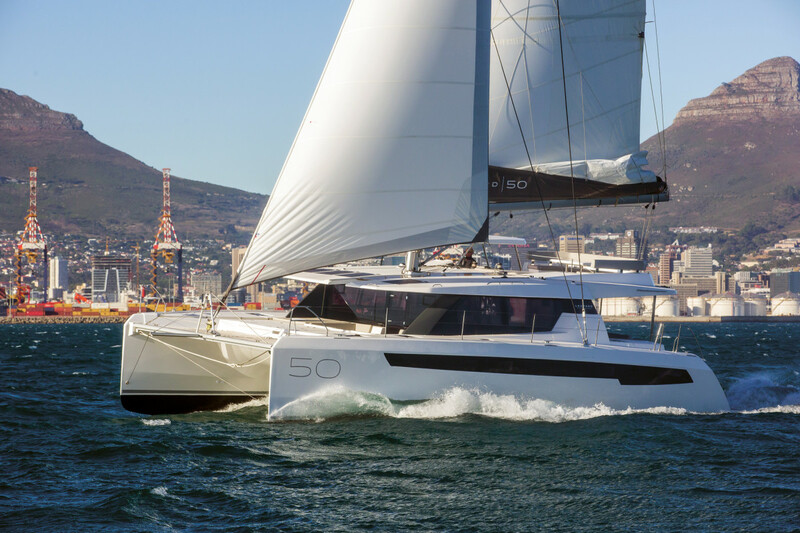 The starting point for the Leopard 50 is a vacuum-bagged and isophthalic resin-infused E-glass hull with an end-grain balsa core. Ring frames of carbon fiber add stiffness without weight gain, and the keels are filled with closed-cell poly foam to prevent water ingress. People sometimes question the ability of a cruising cat like this in offshore conditions, but many Leopards are delivered on their own bottom from the Robertson & Caine yard in South Africa. We had the delivery captain for this 50 aboard for our test sail, and he had spent 52 days crossing from South Africa to Brazil to Tortola to Florida. When the wind was up and in the right direction, he said, he and his two-man crew were banging off 17 knots on autopilot for days on end. That toughness extends to the interior as well, with the wood-grained veneer having the pale look of whitewashed oak, as opposed to fingerprint-prone varnish. Owners are going to revel in this bulletproof finish, with wipe-clean maintenance and no varnish cans in the locker. My favorite spot on earlier Leopards was the forward cockpit, reached through a door from the saloon. Introduced on the Leopard 44 in 2012, it’s fun underway and ideal for a sundowner at anchor with a pleasant breeze. The aft cockpit boasts an immense dinette with 9ft settees that can hold everyone in the anchorage for Thanksgiving dinner or a roast pig. The aft seatback also flips forward to allow guests to contemplate the wake underway, and a Kenyon grill is tucked into a console for charring burgers. The side decks are nice and wide and protected by double lifelines. I like that the hatches are flush with deep gutters for runoff. My new favorite spot aboard the Leopard 50 L—which I’ll destroy all nautical lingo in calling “The Upstairs Lounge”—takes up most of the fiberglass hardtop. A settee wraps around on three sides with comfy backrests on stainless posts and a fiberglass table is equipped with compartments to corral your munchies in a breeze. There’s also an oversized sunpad just forward next to the helm. Speaking of the helm, this is a great office for the skipper, who can easily handle just about everything singlehanded. The deck between helm and mast looks like a Harken catalog, with every manner of turning block, a trio of electric winches and a squadron of Spinlock stoppers for halyards and sheets, the tails of which drop neatly into a canvas bin. Visibility for the skipper is good forward and to starboard, but iffy to port where the house and hardtop block the view. Either dock to starboard, add a camera for portside viewing or be sure to have some crew stationed there to tell you what’s up. A little-added length and beam makes a surprising difference, and you can order a Leopard 50 with up to five staterooms without cramping any of them. The size of this new Leopard allows for a capacious standard master stateroom aft to starboard with a dressing area that leads to an ensuite head. The dressing area has a built-in bureau outboard, a desk/vanity inboard and the berth falls somewhere between a king and a queen. That 17in of added beam also makes for a noticeable difference in the guest staterooms, which now have walk-arounds on each side of the berths, so you don’t have to squirm inelegantly into bed. The standard arrangement puts a VIP stateroom forward in the starboard hull with the same berth size as the master stateroom aft, again with a private entry and ensuite head with molded shower stall. In the port hull are two more cabins, each with private heads and showers. The forward cabin has a slightly smaller berth and can be fitted out as a workshop with a stacked washer/dryer. 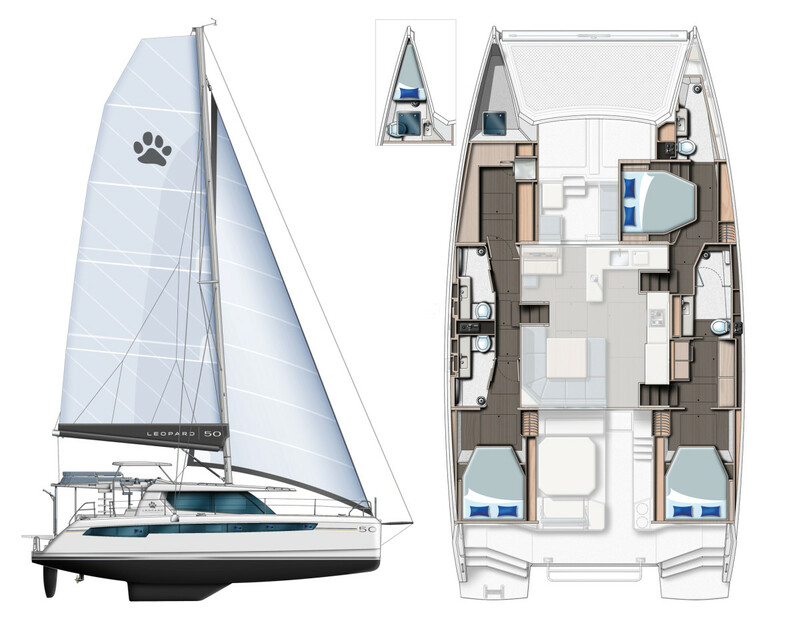 The five-cabin layout eliminates the dressing area in the owner’s cabin and reduces the size of the head, creating a midships cabin with an athwartships berth and ensuite head. Last, you can opt for a mini-cabin (Crew? Teenager? In-laws?) forward in the port bow with a single berth and head. If you can’t keep this straight, just know the Leopard 50 can be ordered with up to six cabins and six private heads to fit everything from liveaboard comfort to bareboat charter efficiency. 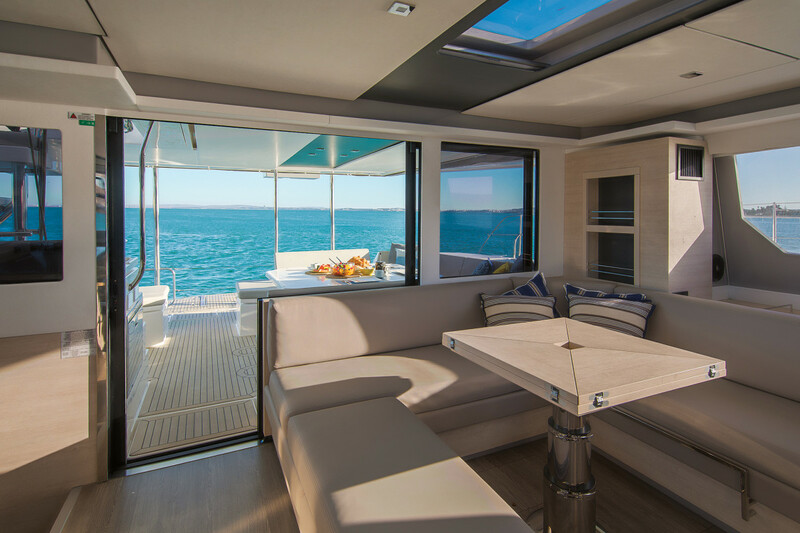 The galley on the Leopard 50 consists of a counter to starboard, with a Miele four-burner cooktop over a Force 10 oven and a pair of Vitrifrigo fridge drawers just aft. Forward is an L-shaped counter with sink and another fridge drawer under the counter. It’s a convenient arrangement, with everything just a step away and out of the traffic. Completing the saloon is a nav station to port, with chart stowage and a dashboard for electronic repeaters from the bridge. Ah, you’re probably saying, the boat’s going to be a bow-wow: raised rig, added weight, more windage. Au contraire! Our boat had a square-topped main from Ullman Sails and was optioned with a short bowsprit to carry a Code 0 for reaching, plus an asymmetric spinnaker. The result was plenty of power for this 50-footer. I had great fun working the Leopard 50 upwind in 17-plus knots of wind in a lumpy Gulf Stream. The steering was also as light and sensitive as a round-the-buoys racer. The Leopard, like many cats, isn’t as close-winded as a monohull, or more accurately, it isn’t happy jammed up to 45 degrees apparent, where we dropped to 7 knots. But cracked off a bit to around 60 degrees, I saw steady 9s and occasional 10s on the steam gauge, which will get you to Bimini or Catalina in fine style. Standard power for the Leopard 50 is a pair of Yanmar 57hp diesel saildrives, and for once, you don’t have to lift a berth to service the engines, with twin cockpit hatches providing easy access. The Northern Lights 9kW genset is tucked forward in an equally accessible deck locker. Our test boat had a pair of the optional 80hp Yanmars, and we topped out at nearly 9 knots at 2,500 rpm. Having twin engines so widely spaced in each hull gives you spectacular control when turning in a narrow channel, and you can work the boat sideways into tight docks. Of note on our review boat was the hydraulic transom platform that can carry up to a 10ft tender and also serve as a “beach” when fully lowered. All told, I loved the Leopard 50, and I think you will, too. Fun to sail, well built and designed, and then there’s that Upstairs Lounge. Nice! U.S. DISTRIBUTOR Leopard Catamarans U.S., Dania Beach, FL, leopardcatamarans.com (954) 925-8050.